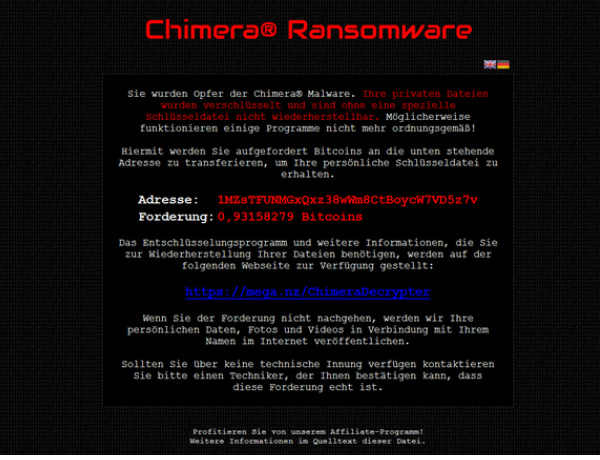 Chimera Virus is a ransomware infection that can slither into your computer and corrupt your files. Once the malicious application is done with file encryption it shows you a message, which claims that the only way to get your data back is by paying the so-called ransom fee. The ransomware is similar to such programs of the same type as CTB-Locker, Coin Locker, Cryptolocker, TeslaCrypt, and some others. We do not recommend following the instructions given to you by cyber criminals. Instead, you should terminate Chimera Virus as soon as you can. How does Chimera Virus work? Chimera Virus gets distributed through spam email attachments and malicious software installers. The harmful file is usually downloaded into the Downloads or Temp folder. Once in the system, the infection starts encrypting your data. It affects all users profiles and corrupts .mp3, .jpg, .ini, .gif, .zip, .dat, .txt and other types of files, however, it does not encrypt executable files. All encrypted files have a .crypt extension added to them. The malware also creates HTML files that provide instructions on how to decrypt the corrupted data. As soon as it completes all of the above mentioned tasks, the ransomware displays a warning message on your screen. The message is displayed in your browser, which starts in full screen and cannot be closed as the parasite disables the “Close” button. The alert disappears after you restart your computer or if you press Alt+F4. The message states that you need to pay 0.93945085 Bitcoins (about $350) using the Tor network, if you want to get your files back. Supposedly, if you make the payment, you will be able to download a special decryption tool called Chimera Decrypter and restore your files. As it has already been mentioned, trusting cyber criminals to follow through on their promises is risky, to say the least. We do not recommend making the payment. What you should do is get rid of Chimera Virus and take care of your data yourself. How to remove Chimera Virus? The sooner you eliminate Chimera Virus from your computer, the better. The only way to do that is by implementing a malware removal tool. You can download the anti-malware utility from our page and use it to terminate Chimera Virus. The security software will scan your system and detect all components of the infection. You will be able to delete Chimera Virus along with other potentially unwanted and malicious files and programs. In addition to Chimera Virus removal, you will also make sure that your PC stays safe and protected in the future as the utility also functions as a malware prevention measure. As for the encrypted files, there are several ways of how you can restore them. The easiest one is to recover the files from a backup, if you have one. If not, you can search for professional decryption tools online and use one of them to restore your data.